Yi mein (pinyin: yī miàn; Cantonese Yale: yī mihn) is a variety of flat Cantonese egg noodles made from wheat flour. They are known for their golden yellow color and chewy characteristics. 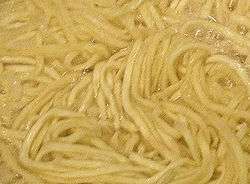 The slightly chewy and slightly spongy texture of the noodles is due to the soda water used in making the dough (as opposed to regular non-carbonated water), which was then fried and dried into flat patty-like dried bricks. The noodles may be cooked a number of ways. They are boiled first, then can be stir fried, or used in soups or salads. 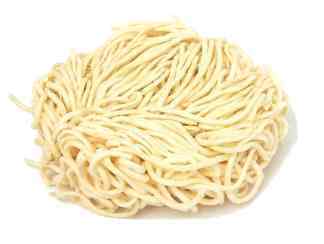 Good noodles maintain their elasticity, allowing the noodles to stretch and remain chewy. Lobster yi mein (龍蝦伊麵), it is sometimes served with cheese in Hong Kong. When Yi mein is consumed on birthdays, it is generally referred to as Longevity noodles or Sau mein (壽麵/寿面). The Chinese character for "long" (長壽麵/长寿面) is also added as a prefix to represent "long life". Usually it is consumed with longevity buns during birthday celebrations. Instant noodles, another type of noodle that was also fried before packaging. ↑ "Lobster Yee Mein". pigpigscorner.com. 10 June 2011. Retrieved 12 August 2012. ↑ "Lobster Yee Mien". www.scmp.com. South China Morning Post. Retrieved 22 October 2015.